Sophisticated drug factories are harvesting cannabis plants worth millions of pounds across West Yorkshire. Organised gangs are using derelict buildings and houses to produce the class B drug on an industrial scale. 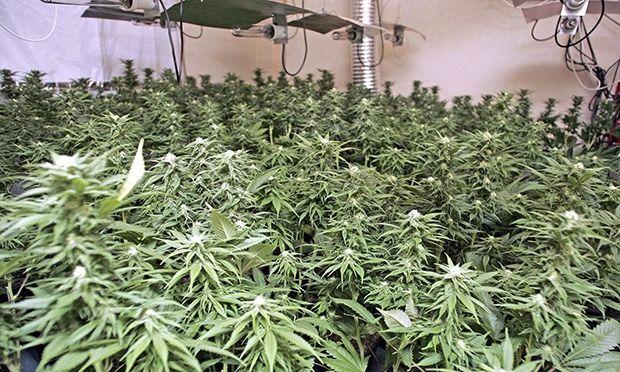 Figures showed between January 1 and June 21, 2014, officers raided 387 cannabis farms in the region. This included 61 busts in Wakefield, 46 in Calderdale and 15 in North Kirklees. During the same period in 2015, police also uncovered 387 farms including 54 in Wakefield, 39 in Calderdale and 25 in North Kirklees. Police are now warning people to be on the look out for the production of drugs in their communities. West Yorkshire Police force drugs co-ordinator Bryan Dent said: “Cannabis is harmful to individuals, harmful to our communities and has intrinsic links to organised crime groups. During the past three months three £1m cannabis farms were shut down by police in Wakefield alone. Police raided a multi-million pound factory at two derelict buildings behind the two old ABC Cinema, Kirkgate, in April this year. It was followed by the discovery of drugs farms at Millennia Park Industrial Estate in Thornes and another at an industrial unit in Horbury, in June. All three buildings contained thousands of plants with the potential to produce cannabis worth millions of pounds. In Calderdale, businessman Stephen Hill was jailed for two years last month after being caught smuggling cannabis to the Isle of Man. Police raided his home in Market Street, Hebden Bridge, and found 4.5kg of skunk cannabis and £7,000 in cash. Hill had also been growing eight cannabis plants at the house. And three men were jailed for producing cannabis in Cleckheaton and Dewsbury in an operation worth more than £100,000 last year. Police uncovered a cannabis farm at a unit in Headfield Mills, Cleckheaton, where plants worth an estimated £60,000 were seized in 2012. They also found equipment that was used to grow another farm on Tofts Road, Cleckheaton, which produced plants worth £31,000. Riki Williams, of Cornmill Drive, Liversedge, was jailed for four years and eight months; Simon Hepworth, of Sykes Street, Cleckheaton, was jailed for three years and two months and Joseph Cox, of Occupation Lane, Chickenley, was jailed for six years and three months. Mr Dent said receiving information from the public was vital in helping shut down drug operations. This entry was posted in All about cannabis and tagged cannabis farm, uk. Bookmark the permalink.